Your spirit lives on every day in my heart. Operation Dog Rescue is dedicated to my little Lillie Mae. I loved her very much & miss her every day. Lil and her pack were on a logging road walk one day in February 2011. She ran into the woods to chase a deer or a coyote and didn’t come out. I searched and searched for hours, regularly walking out to the gate where my van was parked and driving up and down the highway. I had been researching GPS collars for several months but kept putting off the purchase. After all, nothing had happened before. My pack and I had spent countless hours on trails, logging roads, forests. My dogs or foster dogs whose recall is not known or is sketchy, are on long lines. 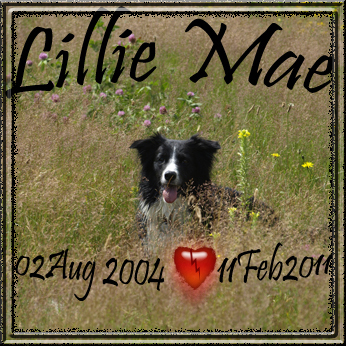 Lillie was typically very reliable off leash. An hour or two after dark, Lillie came out to the highway via a different logging road. She was running back to my van when she was struck by a motor vehicle. When I reached her she was still alive. When we reached the vet a few minutes later, she was dead. I will never, ever forgive myself for Lillie’s tragic death. It didn’t have to happen and wouldn’t have happened had I purchased a GPS tracking collar for her. I cannot stress enough to people who have a dog or dogs that would benefit from wearing a GPS tracking collar, don’t hesitate a day longer. It could be the difference between your dogs’ life or death.